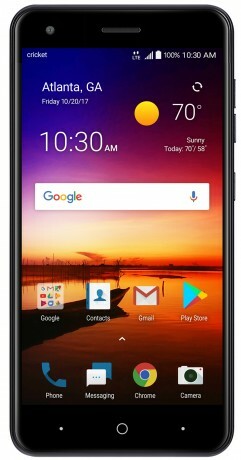 ZTE and Cricket Wireless today announced the Blade X, an affordable Android smartphone with a rear-mounted fingerprint reader. The Blade X sports a 5.5-inch 720 HD screen with 2.5D Dragontail glass. The phone is powered by a 1.4 GHz quad-core Snapdragon 425 with 2 GB of RAM and 16 GB of storage. It supports high-capacity microSD memory cards. The main camera has a 13-megapixel sensor with LED flash and features such as manual, panorama, and time-lapse. The front camera has a 5-megapixel sensor with digital zoom. ZTE gave the Blade X a large 3,000mAh battery with support for Quick Charge 1.0 for quicker powerups. Other features include mobile hotspot, HD Voice, Dolby Audio, FM Radio, USB-C, and a 3.5mm headphone jack. The Blade X runs Android 7.1 Nougat. It is available online and in stores today for $120. Cricket Wireless is offering a number of free and discounted smartphones starting today. New customers who port in their number can snag either the LG Fortune or ZTE Overture 3 for free with an accompanying service plan. The FCC today revealed the ZTE Blade X2 Max in documents made public on the agency's website. The phone, a follow-up to the Blade X Max, appears to be bound for Cricket Wireless based on branding seen on the user manual and AT&T LTE banding (14/30).